I hope you’re ready for some straight talk about comics and the comics industry! This week, I interview professional wrestler and comic-book creator Brimstone, who discusses the many quality offerings from his company, Hound Comics! That includes Brimstone and the Borderhounds, featuring the man himself! We discuss his long-term interest in comics, how the company got started, what creating comics means to him, and what we might expect to see from them in the future! To follow Hound Comics’ upcoming projects, check out their website! Also, Brimstone’s website can be found at this link! Look for their comic offerings at your local comics shop, their online store or many of your favorite online digital comics distributors! In this episode Ben and Dave sit down with former wrestling superstar turned Hound Comics CEO, Brimstone. 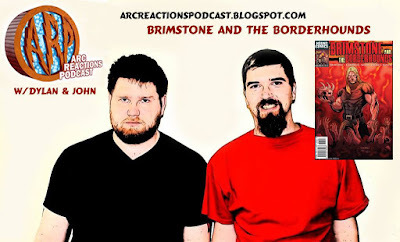 Hear how Brimstone went from being a drummer in a band, to wrestling to taking the comic books world by storm with Brimstone and the Boarderhounds from Hound comics. One of the most entertaining interviews we’ve done so far, so sit back and enjoy!